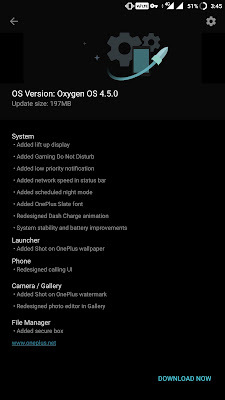 OxygenOS 4.5.0 For OnePlus 3/3T Brings Network Speed Indicator, Blueborne Patches, Scheduled Night Mode, New Call UI & More - AndroGuider | One Stop For The Techy You! 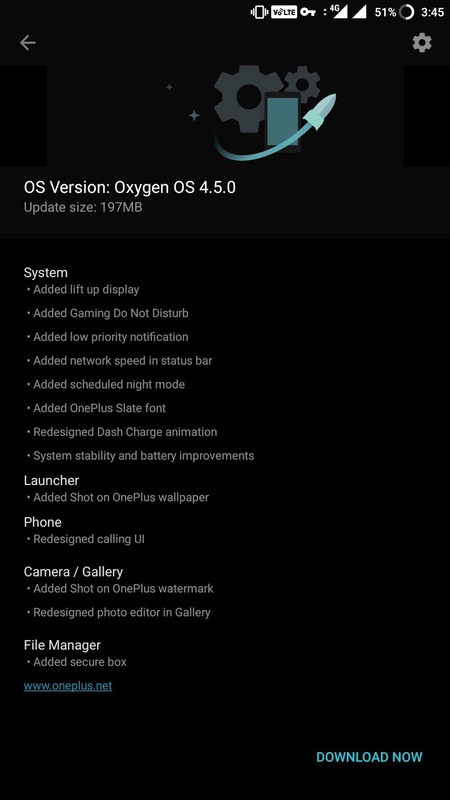 OnePlus is now rolling out OxygenOS 4.5.10 for the 3 and 3T. As compared to the last update of OxygenOS 4.1.7, the version number has been bumped up to 4.5.0 which indicated that this is indeed a big update. This incremental update includes many new features and most importantly fixes for the Blueborne vulnerability which allows a hacker to hijack the user's phone via Bluetooth without the user's consent. Without further ado, let's take a look at the changelog. Although OnePlus hasn't mentioned about fixes to Blueborne, we can confirm to you that the update includes fixes for the same. We say so because after installing the update on one of our team member's OnePlus 3T and checking it using the official Blueborne Vulnerability Scanner by Armis, our 3T turned out to be safe. The security patch level of this update is August 1. The Blueborne vulnerability was patched by Google in the September security patch, but as we saw in the Open Beta 24/15 for OnePlus 3/3T, OnePlus included fixes for Blueborne while keeping the security patch level at August 1. The 197MB update is being rolled out in batches via OTA. It will therefore take some time for the update to reach your device. If you aren't willing to wait, you can either install the update manually from the links below or use a VPN app and change your country to Canada.